From a viewpoint on the Boney Shore Trail along the Labrador Coastal Drive in Southern Labrador, Canada you can look out over Organ's Island and the town of Red Bay. 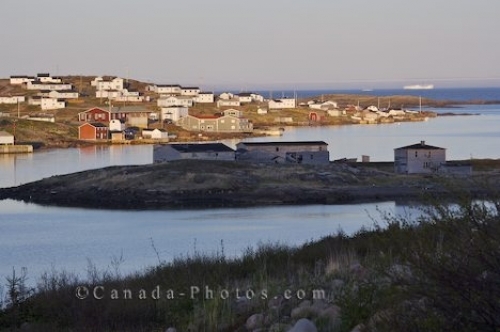 On Organ's Island, old shacks sit atop the rocky landscape while the sun still highlights the town of Red Bay. Old Buildings on Organ's Island with the town of Red Bay in the background, seen from the Boney Shore Trail, Red Bay, Labrador Coastal Drive, Highway 510, Viking Trail, Trails to the Vikings, Strait of Belle Isle, Southern Labrador, Labrador, Atlantic Canada, Canada. Picture of Organs Island in Southern Labrador, Canada with the small town of Red Bay adorning the opposite shore.